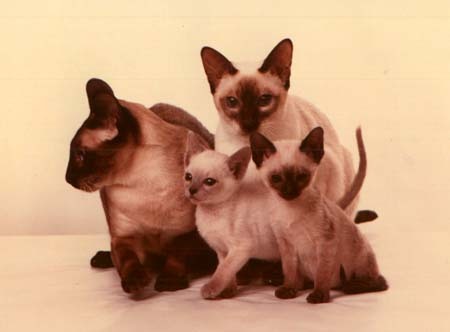 We have had Siamese cats since 1983 and started breeding in 1984. We had no plans for breeding, even though we had purchased the option on their blue slips. However.....(giggle,giggle) Munchkin (female) and Mical (male) had other ideas. Before we knew it, we were hook, line and sinker deep in love with our first litter born on New Year's Day 1985. Although this litter required expensive aid from our Veterinarian, we couldn't and wouldn't be without the joy, comfort and fun of watching little kittens grow, being nurtured and loved by both Ma and Pa pussa cats. Over the years, we have bred most colors in solid, tortie and lynx points, and now settled down to the four rainbow colors - blue, chocolate, lilac and seal points. When our friend Dawn, who was breeding the Orientals, suddenly passed away in December of 1997, we decided to carry on with this breed. Orientals were developed out of Siamese purebred cats. They are sometimes called "Siamese in Designer Genes" as they have over 350 patterns as well as solid and pointed colours. To maintain the blue eyed white Oriental it must be bred back to a Siamese. Here is a picture of my first blue eyed white Snow White just before she was shipped from her breeder in Pennsylvania United States. Snow and Titan's kitten pictures are featured on the Oriental Kittens Page. to continue breeding blue eyed Whites with your bloodlines.